Inspired by success at the music festival in Italy last fall - In…Canto sul Garda 2017 – our choir has been looking for ways to continue to grow the quality of our sound and reach higher levels of refinement in our choral endeavours. 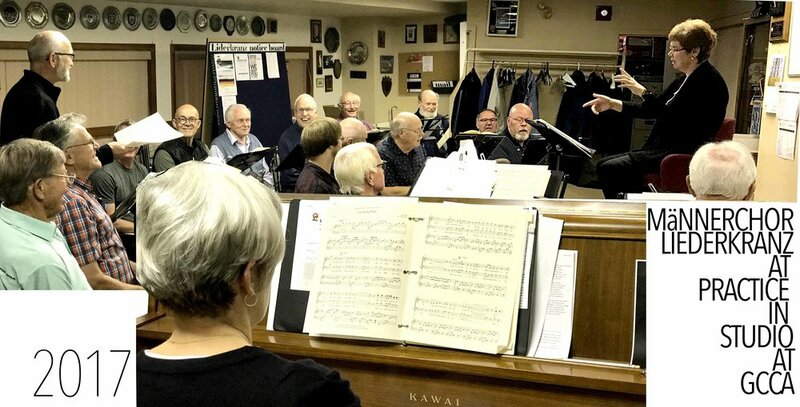 As you may know, we spend 2 hours weekly working on our musical quest under the direction of Donalee Inglis Gorfer in a second floor practice room, 41’ X 22.5’, at the German Canadian Cultural Association facility. Assessing our practice studio we find it, in some ways, lacking: a major shortfall is the ceiling is too low to provide a suitable acoustic environment. Creating a higher ceiling would be cost prohibitive. In addition, most of the surfaces in the room are sound absorptive – carpet on the floor and a ceiling of tiles designed to absorb sound. Here is where we felt we could do something, within our budget, to positively affect our space and improve its acoustic properties. We required more sound reflectance. More reflectance would create an environment where each choir member could better hear his choir mates. Choir members, being able to better hear their fellow singers as well as adjacent choir sections, would help them stay more attuned and thereby creating a ‘better overall sound’ thus, improving the environment for practice. Eight pre-finished birch plywood panel were set up to provide acoustic reflective surfaces for the desired effect. The photo illustrates how the panels are arranged. So far, we have had one practice to assess the effectiveness of the new reflective panels. It is our intention to continue to assess our space, arrange and add to our practice facility so it will better serve our choir in its pursuit of choral excellence.